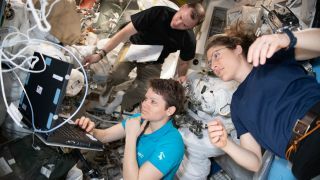 NASA astronauts Anne McClain, Christina Koch along with Nick Hague conduct spacesuit maintenance in the Quest airlock of the International Space Station. Like most Americans on Earth, astronauts must submit their taxes to get 2018 by April 15, 2019. For U.S. citizens, there is no escaping Tax Day — not even in the event that you’ve left planet Earth. Countless Americans are anticipated to have registered their earnings for 2018 by midnight tonight today, and the three NASA astronauts currently living and working at the International Space Station are no exception — even if they are orbiting 250 miles (400 km ) from the nearest H&R Block. Tax Day can be a big source of anxiety for those folks who waited till the final minute to get started (you know who you are), but NASA’s astronauts are not any procrastinators on filing their taxes. “Generally speakingthey take action until their mission begins or [they] get assistance from relatives to file within their stead,” NASA spokesperson Brandi Dean informed Space.com in an email. NASA astronauts Nick Hague, Anne McClain and Christina Koch make up half of the six-person Expedition 59 team. McClain launched into the space station in the Soyuz MS-11 spacecraft at December, whilst Hague and Koch arrived around the Soyuz MS-12 at March. Because McClain left for space before the end of all 2018, she could not have ended filing her taxes for the calendar year beforehand and could have had some assistance from her husband down on Earth. Hague and Koch, on the other hand, needed until they launched to do their taxes. Also onboard the channel are Canadian Space Agency astronaut David Saint-Jacques and cosmonauts Oleg Kononenko and Alexey Ovchinin of Russia’s space agency, Roscosmos. The non-American crewmembers aren’t off the hook for filing taxes; either the Canada and Russia possess their charitable Day coming up on April 30. IRS at Space: How Can people Tax a Mars Mission? Mail Hanneke Weitering at hweitering@space.com or trace @hannekescience. Inform us on Twitter @Spacedotcom and about Facebook. Have a news tip, comment or correction? Tell us at community@space.com.